Conditioners keep your dog's feet from drying out and cracking. Nature outfitted your dog with paw pads for shoes. If your guy is an outdoors-dog who hikes tough terrain, his pads will be durable and resilient. Extreme hot and cold weather can dry your dog's paw pads out, causing painful cracking and possibly infection. Periodically applying conditioner will help avoid pad-cracking. You can find conditioning liquids and ointments at the pet supply store or in the retail section of your vet's office. These are formulated with non-toxic ingredients like balsams and aloe, so they won't be harmful to your dog if he licks them off his paw pads. The natural elements in these types of conditioners are supposed to be a healthy way to moisturize your dog's paw pads and keep them from cracking. In addition to the surfaces on which he walks, temperatures can also affect the health of your dog's paw pads. If your dog spends time in the snow and other cold weather conditions the moisture will be sapped out of his pads leaving them vulnerable to dryness and cracking. Wax-based paw pad conditioners are ideal for dogs who trek through icy tundra because the cold keeps the conditioner from melting and cold wax doesn't rub off easily. If you prefer to treat your dog with home remedies there are several items in your medicine chest or pantry that will condition your dog's paw pads. Painful or irritated paw pads respond well to a 10 minute soak in Epsome salts dissolved in a tub of warm water. 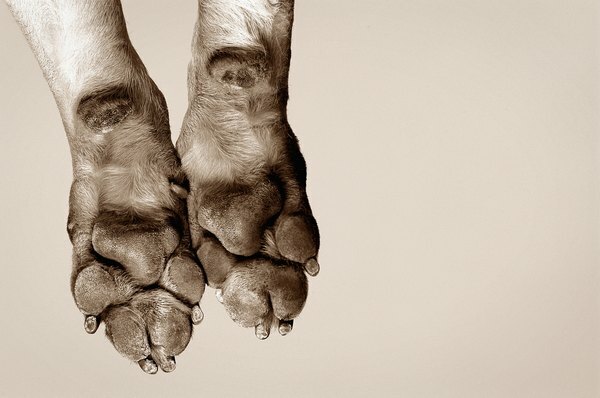 Vitamin E, petroleum jelly or olive oil are other effective moisturizers to condition your dog's paw pads. You may want to put some socks on your dog or wrap a small bit of gauze around his paws to keep him from licking the conditioner off his pads. Or try feeding him dinner right after applying the conditioner to allow it time to absorb while he eats. Don't apply paw pad conditioners too often. Over conditioning can lead to paw pads that are too soft and prone to injury. Never use your own hand cream on your dog's pads, either. Human hand cream could make your dog sick if he licks it off his paws and could also soften his pads more than they need to be. If your dog's paw pads are cracked to the point of bleeding or are obviously infected, he should see the vet immediately. She may recommend an Epsome salts soak and applying an over the counter antibiotic cream. She may also prescribe medication. Let the doctor make that call rather than deciding on the treatment yourself. You should always consult an experienced veterinarian regarding the health and treatment of your dog. Vet Street: What's the Deal with Paw Pads? Canine: Medicine And Disease Management; Cody W. Faerber, et al.